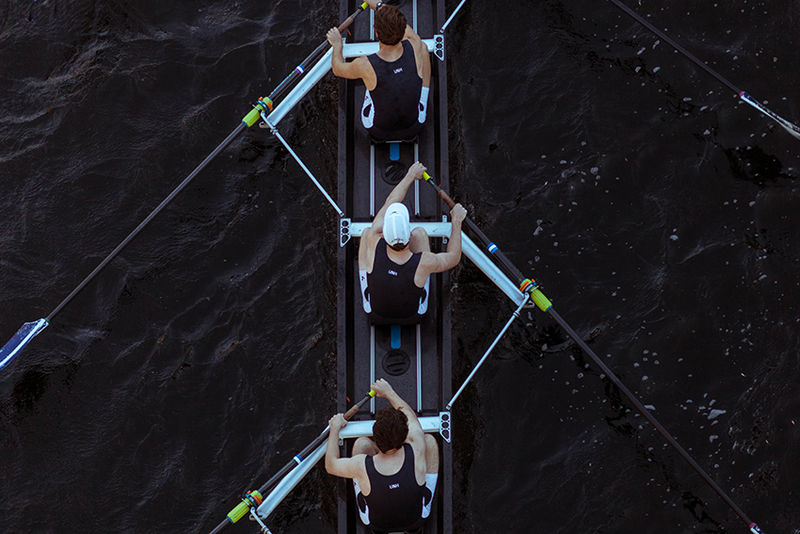 Since 1965, the Head of the Charles Regatta has lured and challenged hundreds of thousands of rowers to the Charles River in this famed sporting event, which—let’s be honest—most of us don’t even know much about (define: “coxswain”). But we flock to the Charles anyway, because it’s a rare opportunity to see the best of the best from around the world compete for glory. Before heading out, here’s a primer on where to watch, where to play, and what to bring to the Head of the Charles. You can watch from anywhere along the Charles, but for a better view, look for a bridge or settle near a boathouse. Races kick off on either side of the BU Bridge near the BU Dewolfe Boathouse and BU Sailing Pavilion. 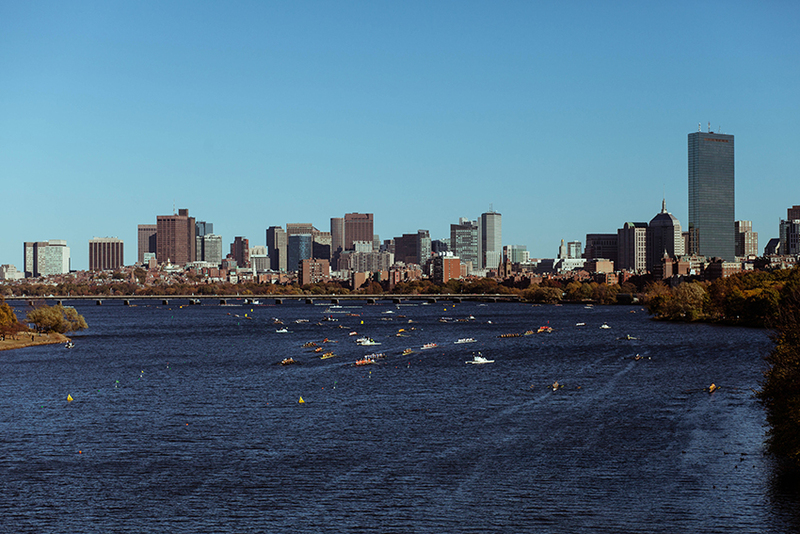 Because the start of the race is also the closest to the city, here’s where you’ll capture the best photographs of rowers at their freshest with the Boston skyline in the background. Bon voyage! The full race is about three miles, so there’s no time to lose as rowers head into mile two. Dubbed “The Powerhouse Stretch,” spectators can watch this segment of the Head of the Charles from the River Street or Western Avenue Bridges. You’ll find the Riverside Boat Club at the northern end of Magazine Beach on the Cambridge side of the river, which also serves as the singles and doubles launch site. Part of what makes the HOCR course so challenging are its twisty turns. One of many reasons a good start during the Powerhouse Stretch is so important is that once rowers get to the Weeks Bridge, the odds of getting trapped or colliding with another team increases. A 90-degree turn makes Weeks Bridge the first of several places rowers must proceed with caution. Those who survive that first sharp turn will pass under Anderson Memorial Bridge, where racers can let out a quick sigh while spectators cheer at the halfway mark. At the end of River Bend Park on the Cambridge side, you’ll find Harvard’s Radcliffe Weld Boathouse, while Newell Boat House is located on the Boston side of the Charles just west of Anderson Memorial Bridge. The halfway mark is where an abundance of spectators gather, with the Weld Exhibition on the Cambridge side and Reunion Village on the Boston side (see “Where to Play” below for more). After navigating a brutal loop past Mt. 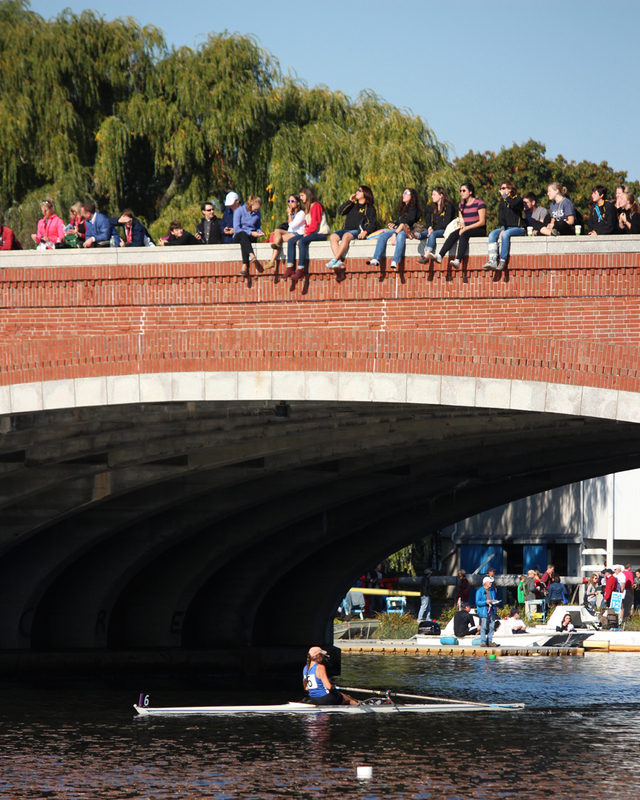 Auburn Hospital, racers are greeted once again by spectators watching from Eliot Bridge near the Cambridge Boat Club. On the Boston side, this is also where viewers can check out the Eliot Bridge Enclosure (see “What to Do” below). From Eliot Bridge, it’s smooth sailing—er, paddling—to the finish line at Christian Herter Park, where times are tallied and winners rewarded. This is also the site of the Rowing and Fitness Expo, where spectators can explore all things related to rowing and boating. You can browse the official HOCR map at hocr.org or download it in PDF form. You can watch from home! Since recent years, the Head of the Charles Regatta has also been live-streamed. Crowds will gather at these hot spots with food, vendors, and more. Located on the Boston side at the finish line, the annual expo will have food, retail vendors, demos, and more. This area is free and open for the public to explore while cheering on rowers as they finish up the race. The expo is also where award ceremonies take place, so expect to hear plenty of cheers, and hopefully not too many tears. 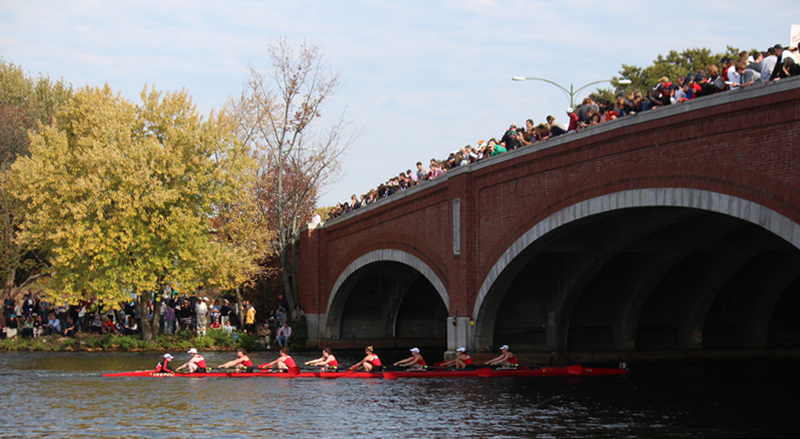 By contrast, the Weld Exhibition takes place on the Cambridge side of the Charles near the halfway mark of the race. Official sponsors and other vendors will give out free samples and sell official HOCR merchandise. Across from the Weld Exhibition is Reunion Village, which includes a dining tent with food and refreshments, seating along the river, and a beer garden. Here’s where you can even register for your own tent, but for those not looking to dish out hundreds for a 10′ by 10′, the price of entry to Reunion Village is $10 for a one-day pass, $15 for a weekend pass, and free for children under 12. The fee here is steep—$90 per day or $150 for the weekend in 2014—but it comes with more perks as well. The menu in 2014 from Citizen Public House and Oyster Bar included a raw bar, crab cakes, steak, and more. In true sports-fan fashion, you aren’t a real spectator unless you’re stuffed and a good bit tipsy. What to bring, who to bring, and—ugh—transportation. Hi, this is Boston, bring a jacket. Heavy, bulky, obnoxious backpacks that not only annoy your fellow spectators, but also freak out security. Unless you’re going to corral them in Reunion Village or the Eliot Bridge Enclosure, then yes, you can absolutely bring the kids out for a nice weekend outdoors. You are also welcome to bring your pets, presuming you clean up after them—that’s not a HOCR rule, it’s a societal one. Let’s say you don’t want to trek the three-mile course time and time again to see your teams start and finish. Take advantage of the HOCR shuttle buses, which pick up and drop off at every mile marker, as well as past the finish line at Birmingham Parkway. MBTA detours: The routes for the 66 and 86 buses are typically detoured. Check MBTA.com for the latest. For race schedules and more info, visit hocr.org.